Very much on the expected lines, the Indian Markets spent the Wednesday’s session in a much defined range while the benchmark NIFTY50 ended the day with a net loss of 8.95 points or 0.09%. We enter the expiry day on Thursday and we will see the session continuing to remain heavily dominated with roller centric activities. Important thing to note that the Index has struggled for several days in the 10365-10410 zones and have not sustained those levels. In all probability, until the level of 10410 is breached on the upside, this level of 10410 will now act as an intermediate top and a important resistance. The levels of 10410 and 10445 will play out as important resistance levels for Thursday. Supports come in much lower at 10305 and 10250. 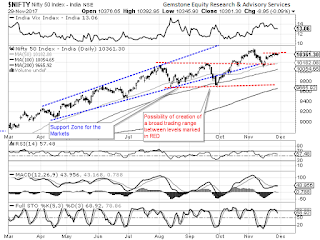 The Relative Strength Index – RSI on the Daily Chart is 57.4833 and it stays neutral showing no divergence against the price. The Daily MACD is bullish as it trades above its signal line but may report a negative crossover again in event of some weakness. Spinning Tops continued to recur on Candles which emphasizes indecisiveness on part of participants. The Pattern Analysis does not paint a pretty picture. With the Index resisting to the levels of 10410 and failing to clear it comprehensively marks it as a potential intermediate short term top. 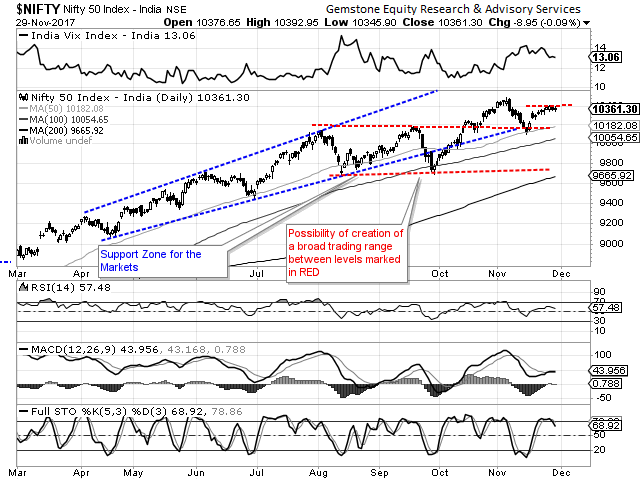 On the other hand, the RSI, which is a lead indicator to has formed a lower top and is seen inching downwards. Overall, it is fairly clear from the technical structure of the Chart and the lead indicators that the upsides in the Markets will continue to remain vulnerable to profit taking bouts. We recommend remaining much light on the overall exposure and keep it moderate. Profits should be protected very vigilantly at higher levels. There are chances that the session may remain volatile owing to expiry of the current derivative series. It is advised to continue maintaining a cautious view on the Markets as the upsides may remain capped unless the 10410 is breached on the upside. Out-performance is likely to remain limited to certain select pockets.